Imagine Classical Academy Indigo Ranch in iConnect Zone, located at 6464 Peterson Road in Colorado Springs, is a charter school authorized by District 49 in 2007. The Pre-K through 8th grade charter school opened in fall 2007. The school is housed in a facility that is approximately 47,758 square feet, located at the intersection of Dublin Boulevard and Peterson Road. The building is two stories and complies in all areas with the Americans with Disabilities Act. Imagine Classical Academy Indigo Ranch is part of the Imagine Schools family. Imagine Schools is an education management organization. Their mission is to partner with parents and guardians in the education of their children by providing high quality schools that prepare students for lives of leadership, accomplishment and exemplary character. The school is committed to living that mission as well as exemplifying its motto, which states that students must be classically trained, culturally literate and globally prepared. The philosophy of Imagine Schools includes six measures of excellence. These six measures, outlining specific principles, are what matter most to any school that chooses to align with the Imagine Schools charter school organization. They include adhering to shared values, parent choice and satisfaction, academic achievement, positive character development, economic sustainability and school development. Imagine Schools regularly evaluates all of its campuses using these principles. Faculty hold themselves accountable to a high metric of excellence with each measure. The public charter school uses a standards-based curriculum incorporating the Colorado standards, the core knowledge scope and sequence and the classical approach. Its educators follow the core knowledge scope and sequence preschool through eighth grade. Students take Latin in grades sixth, seventh and eighth. The school is project-oriented at all levels, which enhances the mastery of core knowledge content. The Saxon math curriculum is advanced one year for all grade levels. Teachers are all highly qualified and deliver an exceptional education to each student based upon their needs. Student life at Imagine Indigo Ranch is not just about academics. Faculty educate the whole child by placing a strong emphasis on positive character development. Each month they focus on one core virtue. All of the core virtues are integrated and embedded into everything the school accomplishes. An equal emphasis on a strong character education program compliments the academic program and stresses character development and responsibility. Faculty members believe that students with great character make not just great students, but great citizens, too. The school offers an after school enrichment program through Champions. Students are also able to take part in well-established martial arts programs, Landsharks running club, Cub Scouts, Girl Scouts and various sports offerings depending upon the season. These enrichment opportunities are available for all ages and ability levels. Another major component of the campus is the partnership with parents and the community. A high level of parent partnership and involvement is expected from both staff and parents. Parent and guardian involvement is a requirement and the majority of the school’s parents exceed all the basic time requirements for volunteering. The Parent-Teacher Organization brings in thousands of dollars each year during fundraisers, and has an active membership of more than 100 parents and teachers. This body of membership serves on 13 different sub-committees, which provide essential help and support to many areas of the campus. District 49’s board-approved strategic plan provides unified vision, goals and strategies to prepare students to achieve like never before. Its strategic plan is organized around a a big rocks metaphor. 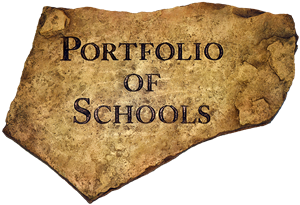 If the district identifies and focuses on what’s most important – its big rocks of trust, community, best district, portfolio of schools and every student – and then adds other things around them, the medium-sized rocks, and finally works in the pebbles, everything better fits together. District 49 has applied this metaphor in its strategic plan, which identifies the district’s Big Rocks. These strategic initiatives will be emphasized over the upcoming years, representing the district’s commitment to its community. These five rocks are its foundation for building an excellent future with its staff, students and greater community.